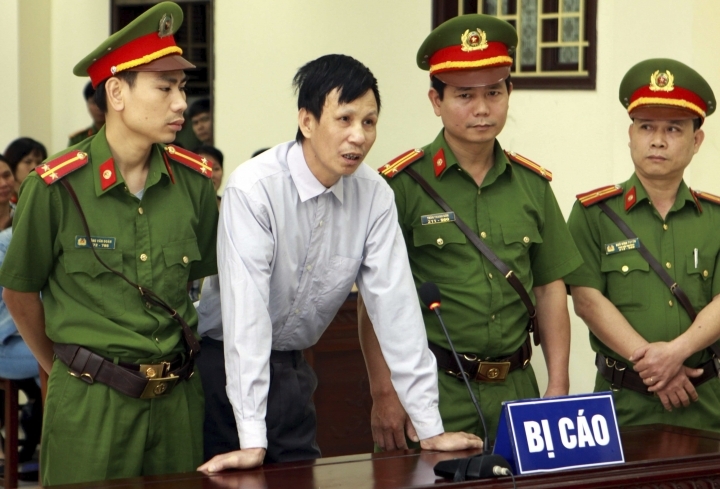 HANOI, Vietnam — A court in northern Vietnam sentenced a dissident to 13 years in prison on Tuesday after finding him guilty of attempting to overthrow the government. He was the seventh activist to be jailed in the past week as Communist authorities step up a crackdown on dissent. The official Vietnam News Agency said Nguyen Van Tuc, 54, was convicted of affiliating with an outlawed group named Brotherhood for Democracy in a half-day trial at the People's Court in Thai Binh province. Tuc was also ordered to serve three years of house arrest after finishing his prison sentence. "The criminal acts committed by defendant Nguyen Van Tuc are particularly serious, directly impacting national security," VNA quoted the verdict as saying. Court officials declined to comment. VNA said Tuc joined the group in 2014 and served as its vice president. The group was a "reactionary organization that operated illegally aimed at attempting to abolish the leading role of the Communist Party of Vietnam and overthrow the people's administration," it said. Tuc was previously sentenced in 2009 to four years in prison for distributing anti-government propaganda. On Thursday, six members of the group, including its co-founder, prominent human rights lawyer Nguyen Van Dai, were sentenced to seven to 15 years in prison on the same charges. Established in 2013, the group says its mission is to "fight to protect human rights recognized by the Vietnamese Constitution and international conventions" and "campaign to build a progressive, democratic, equal and civilized society in Vietnam." The group claimed nearly 80 members. Despite sweeping economic reforms since the mid-1980s that opened up the country to foreign trade and investment and made it one of fastest-growing economies in the region, Communist-ruled Vietnam maintains tight controls on almost all aspects of society including the media and religion. Separately, 47 members of Vietnamese civic groups, human rights defenders and independent media groups sent an open letter to Facebook head Mark Zuckerberg asking whether it is cooperating with the Vietnamese government in suppressing dissent. The letter, released Tuesday, said Facebook has increasingly suspended the accounts of Vietnamese human rights activists and citizen journalists and removed their content. It said the company has been unhelpful in restoring the accounts, and that during the trial of activists on Thursday, "many accounts and pages of high-profile citizen journalists were prevented from posting." "While we applaud Facebook's efforts to fight disinformation in open societies, your efforts are carried out with such a broad brush that it is hurting communities in closed and closing spaces, such as Vietnam," the letter said. The signers said they were dismayed to learn that a Facebook executive had reportedly agreed to cooperate with the Vietnamese government in the monitoring and removal of content. "It would appear that after this high-profile agreement to coordinate with a government that is known for suppressing expression online and jailing activists, the problem of account suspension and content takedown has only grown more acute," the letter said. Asked by The Associated Press for comment, Facebook said it is "committed to protecting the rights of the people who use Facebook, and to enabling people to express themselves freely and safely." However, it said in an email, "There are also times when we may have to remove or restrict access to content because it violates a law in a particular country, even though it doesn't violate our Community Standards." It said it follows the same government request process for the removal of content in Vietnam as it does in the rest of the world.